Ashwini Sharan, MD is Associate Professor and Program Director of Neurosurgery at Thomas Jefferson University and Co-Associate Director of Acute Care for the RSCICDV. He received his medical degree from New Jersey School of Medicine (UMDNJ) in 1995 followed by a neurosurgical residency at Thomas Jefferson University Hospital. In June 2002, Dr. Sharan completed a Fellowship Training in Spine Surgery and Functional Neurosurgery from the Cleveland Clinic Foundation. He received the William H. Sweet Young Investigators Award for his work in MRI and Spinal Cord Stimulation: An Experimental Safety Study. He joined the RSCICDV staff as a Co-Associate Director for Neurosurgery in 2002. His practice focuses on neurostimulation and spinal neurosurgery. He provides expertise in the treatment of Spasticity, Epilepsy, Parkinson's Disease and Chronic Pain. His research interest primarily includes functional neuroimaging although he has a number of publications on all aspects of neural stimulation and spinal neurosurgery. He is actively running 3 or 4 clinical trials. He is the Chair for CNS University of Neurosurgery for the Congress of Neurological Surgeons. He is the President of the American Association of South Asian Neurological Surgeons. He is currently the Secretary and Co-Chair for scientific planning committee for the North American Neuromodulation Society. 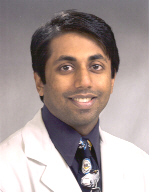 Dr. Sharan has served as a faculty member forseveral review courses throughout the United States and internationally.